For this month's "Maps Of The Month" featurette, I wish to draw your attention to FlyingArmor's Final Fantasy VI (Super NES) maps. It's been quite a year of milestones for VGMaps.com (10 year anniversary, 20,000 maps), and so here we have another one. This is a special Maps Of The Month featurette, as it is the 100th! And so what game would be fitting for this momentous occasion? Why, Final Fantasy VI, of course. So what makes this map set of Final Fantasy VI worthy of being recognized in the 100th Maps Of The Month featurette? First off, the game itself is nothing short of amazing. The sixth instalment of Final Fantasy is probably universally recognized as the best 2D entry in the longest-running console RPG series which turns 25 years old this year, so if I wanted to honour a Final Fantasy game at all in 2012, why not the best? It's a huge game - around 70 maps, and many of them are quite large, with very beautifully detailed and intricate graphics. And it's no secret that I love console RPGs, and it's kind of a no-brainer that console RPGs are exactly the kind of games that almost require labelled maps - and labelled these are. FlyingArmor has clearly taken the effort to make sure these maps are accurate, mapping regions even slightly beyond where the screen can naturally scroll, and arranging the multiple areas within a map with care, as if the mostly-expected "chest and door labelling" wasn't already a fair bit of work for some of these areas! Despite my lamentations that Final Fantasy games still haven't been mapped very much considering the popularity of the series, I don't mind that it's taken almost two years for FlyingArmor to map this as thoroughly as he has. A shout-out to Osrevad and Reidrex for the overworld maps, as well! And these were finished very recently, and I clearly didn't want to wait longer than necessary to honour this! From the Lete River to the Phantom Train to the Floating Continent to Kefka's Tower, we now have one of the best-ever video games immortalized here on VGMaps.com. If you ever embark on an adventure with Terra and the Returners to defeat the evil empire led by the insane Kefka, whether it's the first time or the nth time, you'll certainly know the way. 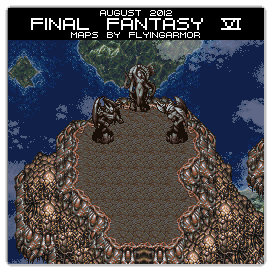 So to recognize the effort put into mapping one of the greatest 2D console epics of all time, FlyingArmor's Final Fantasy VI (Super NES) maps will be known as VGMaps.com's Maps Of The Month for August 2012. I sort of had a feeling this was going to happen when you had contacted me about the progress of the remaining maps last month. It is an honour to have my work acknowledged, especially on such a momentous milestone as the 100th! As for arranging the maps with care, that's probably the artist in me, wanting things to look balanced, clear, and aesthetically pleasing. Working on this game has solidified the style I take with mapping RPGs, I think. Although it took quite a long time to complete this project, I'm happy and relieved to have it behind me now!